The Charente department is home to over 340,000 inhabitants and is located in the south-east of Poitou-Charentes. 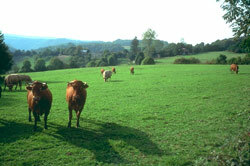 The countryside offers a unique and varied environment for walkers and mountain bikers with its many rolling hills. The northern area is wild with deep forests and peaks reaching to over 1000ft. The Charente has long relied on agriculture to fuel its economy. In the 18th Century, however, the department started mass producing its infamous Cognac drink, which proved extremely popular with people from all over the world. Cognac is made up of a number of vintages, which are aged in oak barrels until they are ready for blending. The best Cognac will spend 40 years inside the barrels. Most of the producers offer free tours of their distilleries, which inevitably involve tasting sessions. They are all fairly similar, although at Cognac Hennessy, you get a ride across the Charente as well. Angoulême is the departmental capital and home to about 100,000 people. The town is divided into two parts. The old town, with its many historical buildings, sits on a hill looking down at the bustling new town. You can walk right around the ramparts, which encircle the old town and find the spot where France's first motor-powered flight took place. It's best not to do this in September, however, as vintage car racing takes place here every year at this time. The town of Cognac is encircled by vineyards, on which the local economy is dependent. It is a fairly small town with fewer than 20,000 inhabitants. 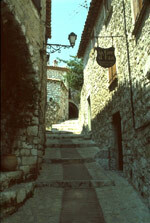 The old town is a maze of narrow streets lined with 15th - 17th century buildings. There are quite a few interesting museums in the town. The Musée de Cognac has an extensive display covering local culture and fine arts. The Château de Cognac, meanwhile, was the birthplace of King Francois I. In the north of the department you will find the small town of Ruffec, home to just 3000 people. It sits on the banks of the River Charente amongst scenic countryside and provides a relaxing location for people of all ages. A church dating from the 16th century serves as the town's centrepiece. Depending on where you want to be in Charente, airports to use are Poitiers and La Rochelle, which are found in neighbouring departments. The airports at Limoges, Bergerac and Bordeaux are also possible options. All have direct flights to/from the UK. Property prices in the region can be fairly high, mainly due to the interest of Parisian buyers. The advantage is that there is a strong rental market. Angoulême has the most expensive properties but also the best rate of return for renting out. Do you know Charente better than we do? Do you have photos of Charente?